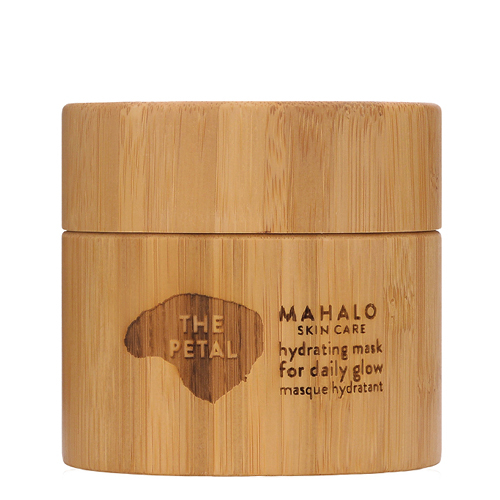 The Petal Mask Hydrating Treatment by Mahalo Skin Care is a rich and decadent pre-mixed face mask that brings out the look of natural glow and vitality. This mask melts luxuriously on the skin and dries to a pink sheen, without a feeling of pulling or tightening. The longer you leave it on, the more it seems to beautify your skin. The base of enzyme-rich honey makes skin feel silky smooth and moisturized, while rose clay and cacao leave the complexion feeling soft and gently detoxified. Floral essences of rose, hibiscus, chamomile, jasmine, ylang ylang and rose geranium are perfectly arranged to create the ultimate skin beautifier, gentle enough to apply pre-event or several times a week. Use as often as desired. 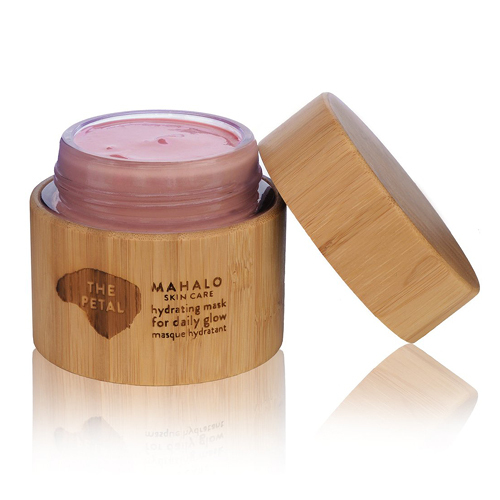 This hydrating mask by Mahalo Skin Care may be applied with the finger tips but works best applied with a brush. Begin by cleansing the skin with warm water. Apply one teaspoon of mask on clean skin, avoiding the eye and mouth areas. Allow to remain on skin for 10-20 mins or until dry. To remove, use a wet warm face cloth, or wash-off in a shower. If you find the mask to be too thick, scoop one tsp of mask in a bowl, add a few drops of water or hydrosol, blend well and apply. The Petal Mask makes a wonderful morning treatment, applied 10-20 min before a shower, or as an evening treatment while taking a bath. I've been using The Petal for about a year and have purchased it twice. I feel that Mahalo products often start out a little overwhelming and grow on me over time. That is true of The Petal. They are intense and complex experiences. The fragrance is strong but over time this went from feeling suffocating to becoming a relaxing experience as I used the mask. After removal, my skin is soft, clarified, and dewy. I notice that I just look a little younger and prettier than usual after I use this product. So I use it a lot! One note is that this is a very natural product and I saw a lot of variation in texture from one jar to another. The first jar was almost runny, and it was easy to spread with a brush. The contents of the second jar are almost clotted, and I have to carve out a dollop of product with a spoon and warm it a lot in my hands before it will spread. Same great results, though! I prefer the looser texture but the experience of spreading it over my face with my hands after the gluey version warms up is fun. Let's start from the aroma of this mask, it carries you away from the moment you twist the lid! It is very gentle and smooth, I leave it on for about 20 minutes as I am having a breakfast. After washing it off, the face feels incredibly smooth and clean! Ah the Petal, where have you been all my masking life? This is my first experience with any of Mahlo's products, and I have to say I'm impressed. My simple routine consists of a quick facial steam and then applying this mask with short flat brush. I just learned today that you can mix the mask up a bit to lighten it up a bit (Mahalo IG page) which I think will help with application. After warm clothing the mask off my skin is felt refreshed and plump. Not at all tight or greasy. The post-honey-grease-masking feeling is not my cup of tea. This mask is in my top 5 favs. I know people love the scent, however I find it a bit strong but totally dealable.